Auckland City will take on some of the best players on the planet yet again at December’s FIFA Club World Cup after lifting the OFC Champions League trophy for a ground-breaking sixth consecutive time.The Navy Blues earned the right to represent the South Pacific in Japan with a comprehensive 3-0 defeat of Team Wellington this afternoon at QBE Stadium in Auckland, Micah Lea’alafa proving the inspiration with a double and an assist for the victors. Having wrestled the ASB Premiership title from out of Auckland’s grasp at the same ground in March, Wellington were looking for a similar outcome today but instead add to settle for a repeat of the defeat they suffered in last year’s OFC Champions League final to the same opponents. To have any hope of upsetting the eight-times champions, Wellington needed to frustrate Auckland for a long as possible and disrupt their passing game but those tactics went out the window straight away when City struck in the opening minute. Wellington goalkeeper Scott Basalaj got a hand to that effort but was left clutching at air when Lea’alafa again made a nuisance of himself and picked out a cross to Joao Moreira, whose first-time volley came crashing off the underside of the cross bar in the 42nd minute. That meant the half-time score was only 1-0 but Auckland must have wondered how they had failed to increase that advantage after completing dominating proceedings. In contrast to the tight and even action of most finals, the Navy Blues had enjoyed 75 per cent of the possession and fired 11 shots towards goal while Wellington were yet to muster a single effort. Matt Calcott’s side therefore needed to improve in the second half to keep their hopes of reaching Japan alive but instead continued to struggle to make an impact on the game and it was always likely to be Auckland that scored next. When the second goal did finally arrive in the 67th minute, there was again a touch of class about it and it was that man Lea’alafa who sparked it once more. The Solomon Islands international was clearly enjoying his time in the glorious Auckland sun and another run down the right allowed him to tee up Clayton Lewis, who made no mistake in tucking a cool effort past Basalaj. Wellington now had to produce something truly special to turn things around and never looked like doing so as Auckland goalkeeper Diego Rivas was left largely untested. The task was made even harder in the 83rd minute when Feneridis received his marching orders and the final nail was driven into the coffin just a moment later. Yet again it was Lea’alafa causing the damage, the pint-sized winger dinking a ball to the far post which Ryan De Vries headed back across goal for Moreira to attempt a bicycle kick. The Portuguese striker did not make the desired contact with his spectacular effort but the ball broke to a well-positioned Lea’alafa and he drove a volley through several players to find the net, thus wrapping up a forgettable day for Wellington. “It’s been a good campaign but it’s difficult to think about that at the moment,” captain Bill Robertson said. “Obviously, we’re hugely disappointed with the result today. Our first-half performance was poor and we never really recovered from that,” he added. Opposing captain Angel Berlanga was delighted to have booked a return to the world stage. “We are really happy because there has been so much hard work from the team and the staff – now we are going to Japan again,” he said. There was further glory for Lea’alafa when he picked up the Golden Ball as the tournament’s best player while Basalaj earned some consolation in receiving the Golden Gloves. Auckland’s Moreira collected the Golden Boot while the Fair Play Award went to Papua New Guinea’s Hekari United. 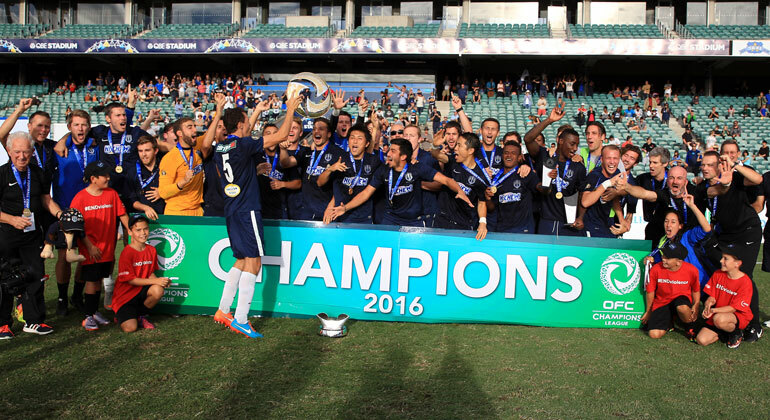 Oceania champions Auckland will now begin their preparations for the latest edition of the FIFA Club World Cup, which is set to take place in Japan from December 8 to 18.